Good-bye, artificial colorants and toxins! Hello, delicious fruits, veggies, and spices. Mother Nature provides beautiful natural foods that are filled with gorgeous colors providing a wonderful alternative to synthetic and artificial dyes. Hooray for nature! 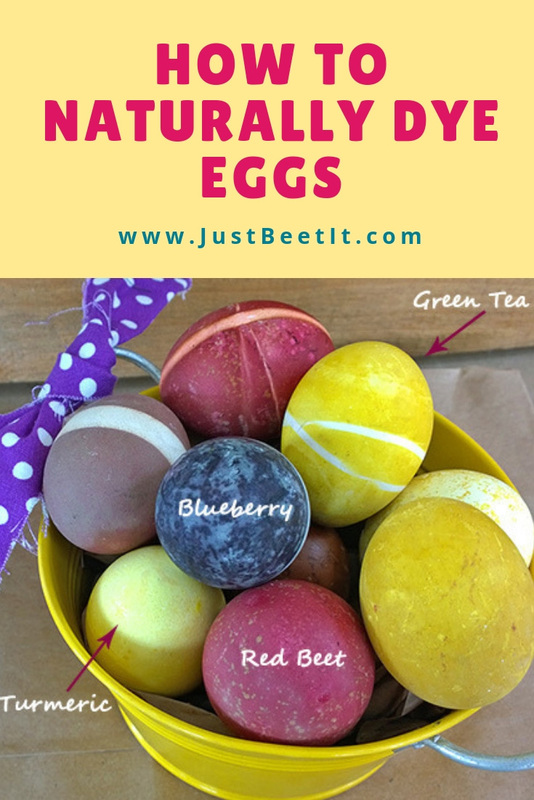 Besides the vast nutritional benefits from natural dyes, coloring eggs with vibrant red beets, green teas, turmeric, coffee grounds, and blueberries (to name a few) can be a uniquely fun learning experience for everyone. I have fond childhood memories of coloring eggs with my family. My siblings and I practiced healthy competitive sibling rivalry trying to create the most uniquely colored eggs. The picture to the right shows my sister, gramps, and me proudly showcasing our bowls of brightly colored eggs. Oh the wonderful memories! Our house was THE place to be for Easter egg hunts, egg tosses, and egg coloring. We lived on a large property that provided incredibly epic egg hiding spots. My parents encouraged fellowship and festivities, and every Easter weekend, our expansive yard was filled with friends and family (of all ages) coloring eggs and searching for well-hidden candy in plastic eggs. My mom and dad were expert egg "hiders" and several weeks later we would still discover eggs with melted goodies inside. Jackpot! Egg coloring and Easter festivities remind me of time spent with family and friends. That's why I LOVE naturally coloring eggs (especially for children) as the activity encourages family involvement, healthier options, and learning experiences. When involved in the process, children discover the amazing benefits of fruits, veggies, and spices. Plus -they will look forward to checking the changing egg colors each day. Cheers to creating more beautiful memories with family and friends! 1. For veggies and fruits, add 1/2 cup - 1 cup chopped veggies/fruits to 1 cup water. For teas , coffee, or beet juice, do not add more water, just use the liquid as a dye. For a quick beet dye, use beet juice (homemade or purchased) or buy an inexpensive can of no salt-added sliced beets (under $1)! You can also use a couple teaspoons of beet powder mixed with water for a lighter shade of pink. 2. Bring water and chopped veggies or fruits to a boil. Reduce heat and simmer for 15 minutes. 3. Remove pan from heat and let liquid dye cool to room temperature. Once cooled, use a strainer to pour liquid into mason jars or bowls, removing any food pieces. For a chunky, textured egg dye, leave food in containers. Food pieces give an awesome speckled appearance (see blueberry dyed eggs above). 4. For teas and coffees, make about 2 cups strong-brewed coffee or strong-steeped teas. The darker the liquid the better! For spices, turmeric for example, use a 1:1 ratio of dried/powdered spice to water. For example, the turmeric dye used for the yellow eggs (featured below was created with 3 tbsp spice and 3 cups boiling water. Make sure spice powder is mixed well with hot water or the powder may settle at the bottom of your container. If this happens, stir dye a few times throughout the egg dying process. 5. Add 1 tablespoon of white vinegar into each bowl or jar of dye. Creating some type of acidic environment works best for egg coloring as the acidity balances the dye-bath's pH encouraging ideal conditions for egg coloring. Vinegar is the cheapest most widely available acidifier, but you may also use citric acid or cream of tartar. 6. Add hard-cooked eggs (see tips for hard-cooking eggs below) to dyes by fully emerging. Refrigerate eggs in containers for 12 to 48 hours depending on how vibrant you wish egg colors (I kept my eggs submerged for about 48 hours). When eggs are dry, remove rubber bands. Use mason jars for easy set-up, storage, and clean-up. Cover containers to avoid spilling dye (I speak from experience!) all over your counters and refrigerators. Experiment with both white and brown eggs (white eggs show more vibrant colors). To create "marble" eggs or eggs with unique textures, leave chunks of fruits, veggies, or coffee grounds in dye liquid. While eggs are slightly damp, gently rub eggs under cool running water for a speckled appearance. For solid colors, make sure dye is completely liquid. Wrap eggs with rubber bands to create lines (see video). No two eggs will be the same! The picture to the right is an example of two eggs (1 white and 1 brown) dyed in the same blueberry coloring. They are different in shades and textures. 1. Place eggs in a saucepan or pot and cover with water (Note: the older the eggs, the easier they are to peel). 2. Bring water to a boil and then reduce heat to simmer. 3. Simmer eggs about 12 minutes (for large eggs) and 10-11 minutes (medium eggs). 4. Remove pan/pot from heat. Carefully drain eggs. 5. Allow eggs to cool in pot or quick-cool eggs by transferring eggs to bowl of ice water. Refrigerate until ready to dye or eat.